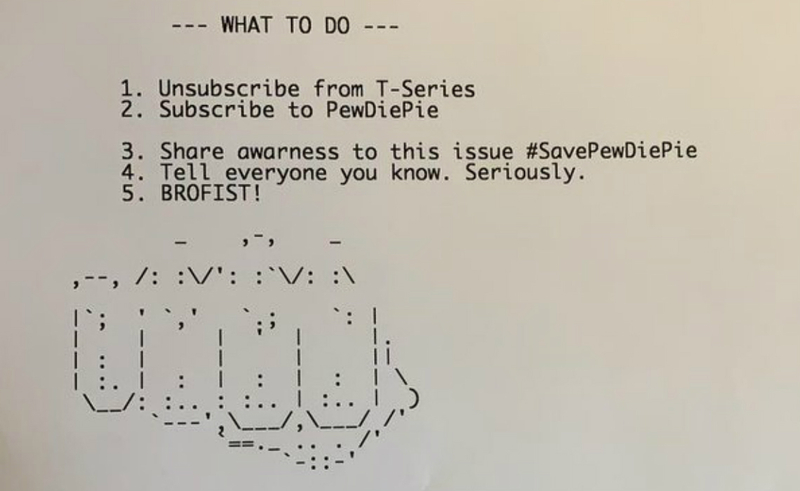 A number of printers in Canada and the U.K. are spitting out notices telling people to aid top YouTuber PewDiePie in his struggle to remain the most-subscribed-to creator on the platform. Over the past few days, people have posted photos of the notice, many of them saying it popped out of their printers at work. The printout gives readers a brief rundown of the fact that Bollywood record label T-Series is coming ever closer to overtaking PewDiePie’s subscriber count. It then asks recipients to unsubscribe from T-Series, subscribe to PewDiePie (whose real name is Felix Kjellberg), and rally on social media with the hashtag #SavePewDiePie. Kjellberg has not yet commented on the hack.